Candy Canes is made from a red material covered in a white candy cane pattern. He has black button eyes and a larger black button nose. 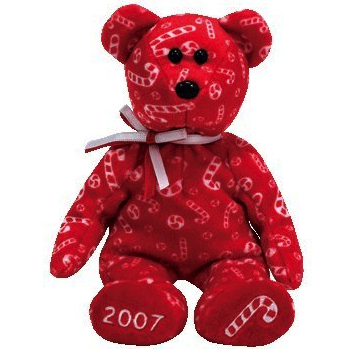 He wears a red and white ribbon around his neck and on his left foot he has a embroidered candy cane and on his right foot he has “2007” embroidered in white. Candy Canes was released on 28th September 2007. His birthday is on 19th December 2006. There are two versions of Candy Canes. This red version and a white version with a red candy cane pattern. They both have the same style number. Candy Canes is a Hallmark exclusive Beanie Baby.